Now, as we all know, it is awesome to have a faerie or Darigan Kougra, or a glowing Uni, or a jelly Blumaroo. Most people think of our wonderful, sweet, cute pets as trophies. Well, guess what? THEY ARE NOT. The reason Neopets was created was so people could love and cherish their pets. It did happen, but only for a bit. More potions, colors, pets, paint brushes, and magical plushies were released, and then, clothes. This all was the beginning of the mistreatment of pets. Not starving, or anything like that, I mean ignoring your pet, or Neglect. You would be horrified to see your Darigan Kougra turn blue, or red, or something like that, so you pamper them. This is not true love. It is selfish, horribly proud, and should never be done. But, what do we all do about it? Usually, nothing. But people who look at many accounts see the same thing, get annoyed, and write for the NT. We always hope that we get in. I am not saying you should ignore your pet. It is wonderful to be pampered a bit, and all that, but I say: REALLY love your pet! I must look like a fool, to like pixels. But, this site also teaches responsibility, love, sociality, and fun. I am also not saying it is wrong to make your pet look nice, and pretty, dressed up and painted; I am saying you should not use them to say: "Oh! I am so rich!" Use them to say: "I love and care for pets, real and virtual, and you should too!" Take care of them. Spend at least a quarter of your time in Neopia on your pets. This will keep them happy. Also, do try to get more neopoints, and not for silly little items for your gallery. Neopoints are for pets. This was what it is supposed to be. Unfortunately, it is not. Neohomes, galleries, shops, all that. I also like to make my pets pretty, and such. But I know that is not the whole point of Neopets. The point is: Take care of your pet, and have fun! Yes, you can have great pets, a great gallery, expensive items in your shop, and still love your pets. Being rich does not make you a bad owner. You are a bad owner if you think of your pets as trophies, and all that. Give your pets good names, not like _Moohoo1245. That, as I am sure many will agree, is a horrible name. Give them names that you might want. Give them names YOU like! A name symbolizes how much time you spend looking for a name your pet would like, and do not go only for avatars. Pets are great things, and should be loved and cherished by their owners! I like names like: Mistfall, BlessTheWings, like that! I only have a few pets, so I can be a better mentor and owner to them. Yes, mentor. You should read to your pet, play with them, feed them good foods! I know I would hate to eat soup or omelettes every day! When TNT changed the site layout, and the look of the pets, I was furious. I left for a while. Then, I was a pet-is-a-trophy person. Then, one day, I got it in mind to read the NT, and read an article. It told me what I was doing, what I was like.... I was horrified. I immediately went and looked at my pets, got them fed, all that. I now regret ever being like I was. Now, I have looked at thousands (maybe not quite literally) of lookups, and found most of the pets were unhappy, hungry, even sick! And people who had not been on for more than a year! I myself quit, but only a few months! I still like to get my pets all pretty, but not like that! We often put pets that are plain with good names in the pound so we can get pets with horrible names. Why not just save your neopoints? 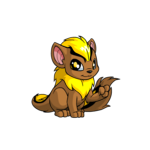 I once had a Kougra with a great name, and I was forced, yes, FORCED to abandon him for a painted pet! I STILL would like him back! 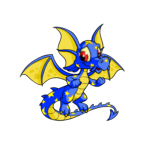 Now, most of us have had a situation when we are just browsing the pound (which, unfortunately, is closed right now), and we see a painted pet with a fabulous name, and guess what? We have four pets! So you miss out, and lose a pet you would have loved for a long time. We all hate it when that happens. If you do not have much money, or are going on a vacation where you will not have a computer, this is a great place to put your pet. It will keep them well fed and happy. Sound nice? It is! As we all know, when you get a quest, when you give them the item they want, they will either increase some stats, or give them a feast. Great, huh? Also, if you never quit, you have a better chance of getting a Fountain Faerie quest! Because, if you quit a quest, you cannot get another one for a few hundred seconds. Imagine, if you had completed the quest, maybe a few minutes later, the Fountain Faerie would come by! Most of us like to get our pets expensive toys that they only break. Why waste the money you could spend on Battledome training, paintbrushes, when pets are perfectly happy with a blue Ixi plushie? Most of us also feed our pets gourmet foods when pets are perfectly happy with a cheap old carrot from a shop? I am not saying you should give your pets the same foods every day; give them a healthy, balanced diet! Sometimes, our pets get hurt or sick in dailies or the Battledome. Why spend over 100k on the cure for reptillioritus, when you can get your pet cured for free at the Healing Springs?